This unisex talking watch (pendant for ladies/pocket for men) is a beautiful piece to accessorize any ensemble for any occasion. The watch is easy to operate with just a single button. Press it and the watch speaks the time. Press it again and it speaks the day, date, and year. Watch functions with a Choice-of-Voice feature and can easily operate in either a male or female voice. The gold casing shines brilliantly and the 1.25" diameter white face is big enough to tell time easily yet not too big to put in a pocket or hang from the neck. 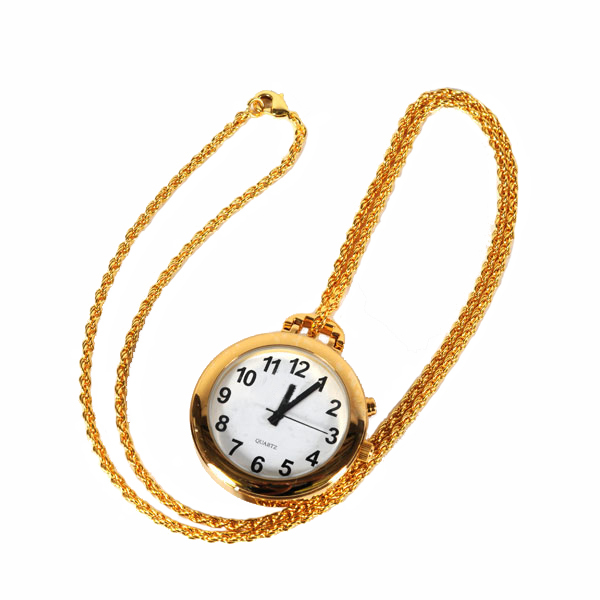 For ladies, the watch comes with a 28" gold chain that is perfect for accessioning as a stylish pendant. For men, the chain can be used with a suit vest as a classic pocket watch, or just put the watch in your pocket and know that it's there when you need it. Beautiful and uncomplicated! * Face with casing measures 1.375 inches; face alone measures 1.25 inches.